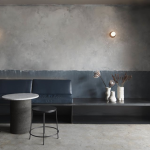 Harvest in Newrybar is one of those places I have been meaning to write about since starting Get Forked and Fly back in February 2015. I just never got around to it, as everyone else seemed to have the Harvest story covered. 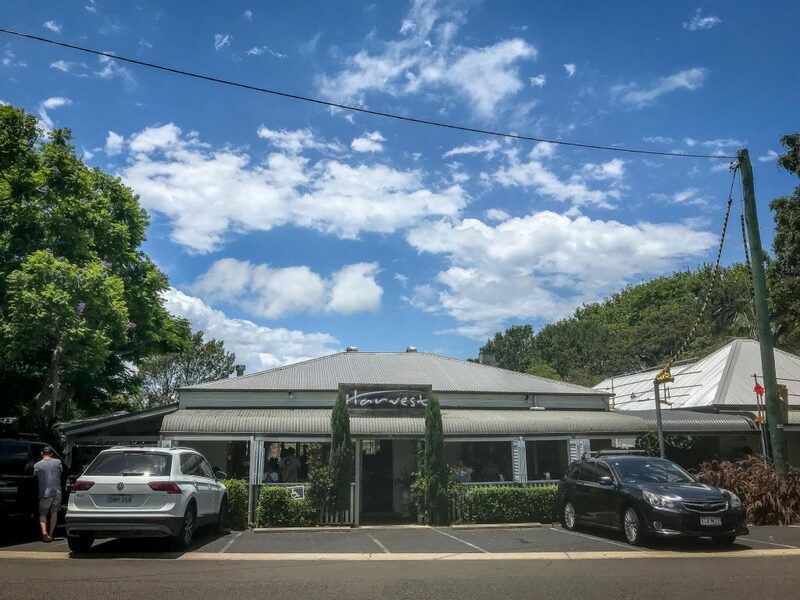 Recently I thought: “What can I write about Harvest that hasn’t already been read?” You already know that the restaurant currently wears one hat courtesy of the Sydney Morning Herald Good Food Guide 2018 and that it also won the Gourmet Traveller Best Small Wine List of the Year Award in 2017 among numerous other awards over its 10 year history. 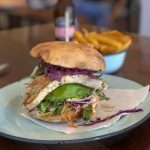 The menu tips its lid to locally grown and produced organic ingredients as well as foraged native and wild Australian ones. Harvest in Newrybar is a destination venue for lunch and dinner seven days a week and breakfast on weekends. What’s left to say? 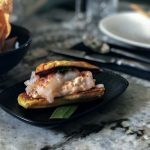 For me, Harvest in Newrybar is actually much more than Harvest the restaurant. Yes, sitting on the restaurant deck overlooking the kitchen garden and treetops is a beautiful experience. 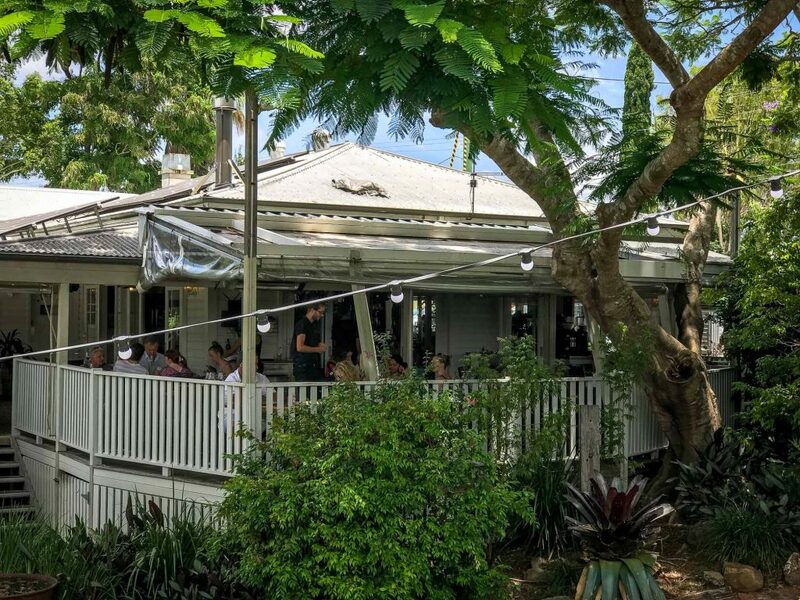 The restaurant is picturesquely perfect with white timber walls wrapping around the ‘Queenslander’ verandah, splashes of imaginative greenery and, of course, the lilac flowering jacaranda out front. 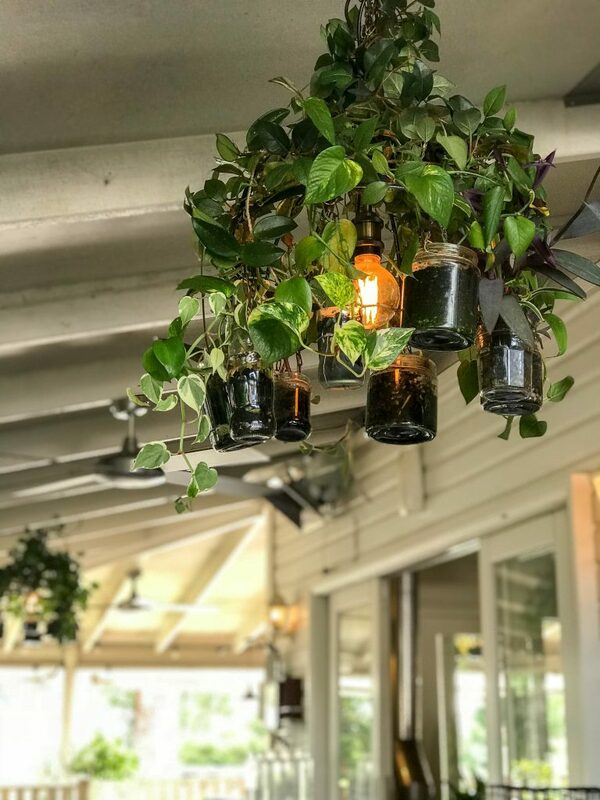 The restaurant menu is sophisticated and changes seasonally with the availability of local and native produce. 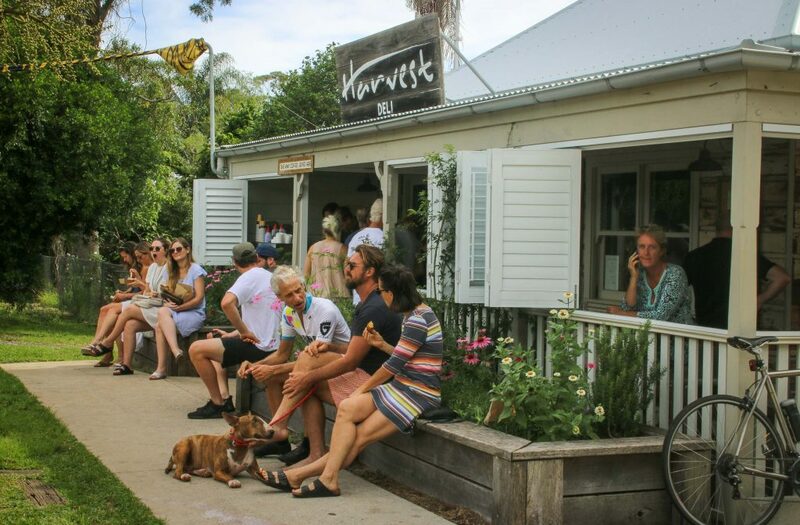 The award winning food (and the wine) is why so many visitors to Byron Bay make the pilgrimage into the hinterland for a Harvest experience. 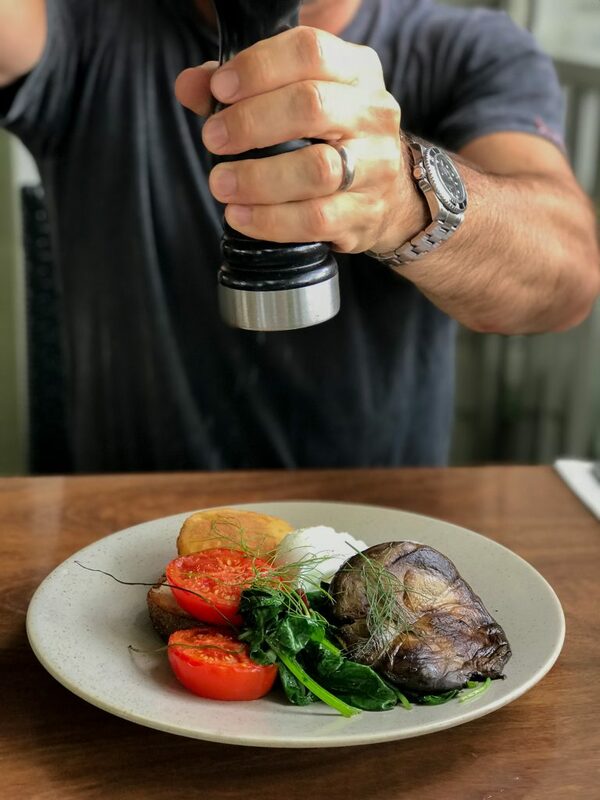 A peak at the current Summer breakfast menu includes dishes like the Roast mushrooms, tomato, sautéed wild greens, potato scone, sourdough. For lunch: Grilled kangaroo, sweet potato, native dukkah with Davidson’s plum ketchup and for dinner: Local fish, native spiced broth, fennel and coastal succulents. 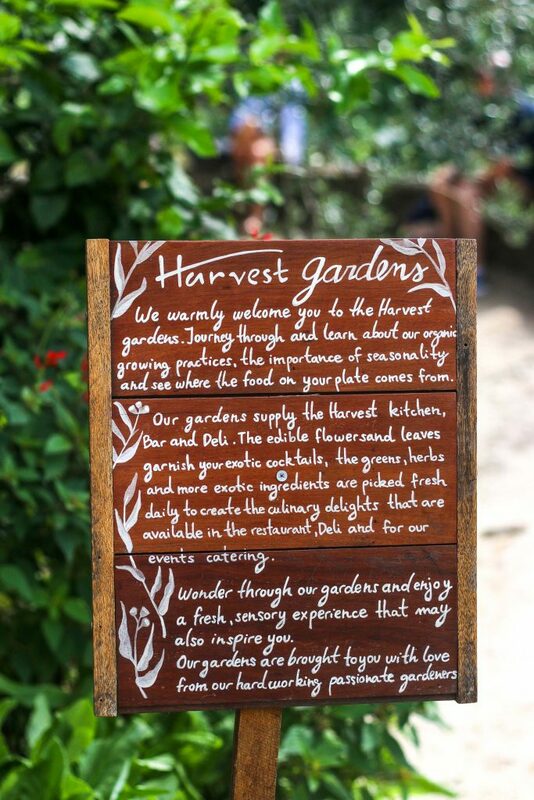 I find some of the native ingredients are an acquired taste and for that reason, the Wild Harvest dinners where guests are gently introduced to new native and wild flavours by the Chefs and resident expert Peter Hardwick, are a good idea. The Harvest restaurant staff are always friendly and hospitable. I was a little let down on a recent weekend breakfast visit when my roasted stone fruits were served uncooked. I’ll take the blame for not mentioning the error as soon as I put my spoon into the peach, but I also developed an inkling of doubt in my mind that I may have misread the menu, so I ate my breakfast as it came. When checking at the end of the meal, our waiter confirmed that the fruits should have been roasted and notified the chefs while the host graciously deducted the charge from our bill. That’s good service but a big oops in the kitchen. That aside, back to why Harvest in Newrybar is special to me for reasons beyond the restaurant. 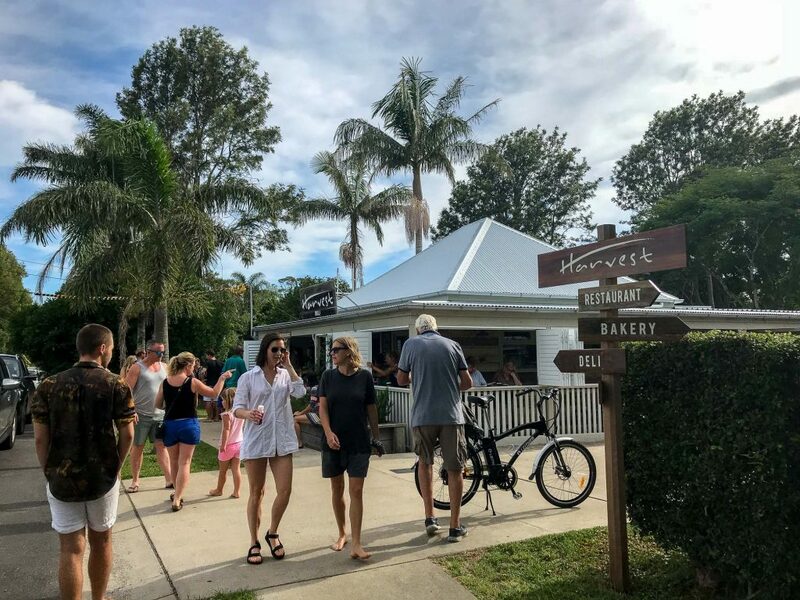 On weekends, locals and travellers will form a deep queue outside the Harvest Bakery before opening time at 8am to snap up something delicious for breakfast. The 100 year old bakery was once the village’s community oven where everyone would bring their bread dough to be baked. Nowadays it’s still a community affair with regulars making the weekend pilgrimage. 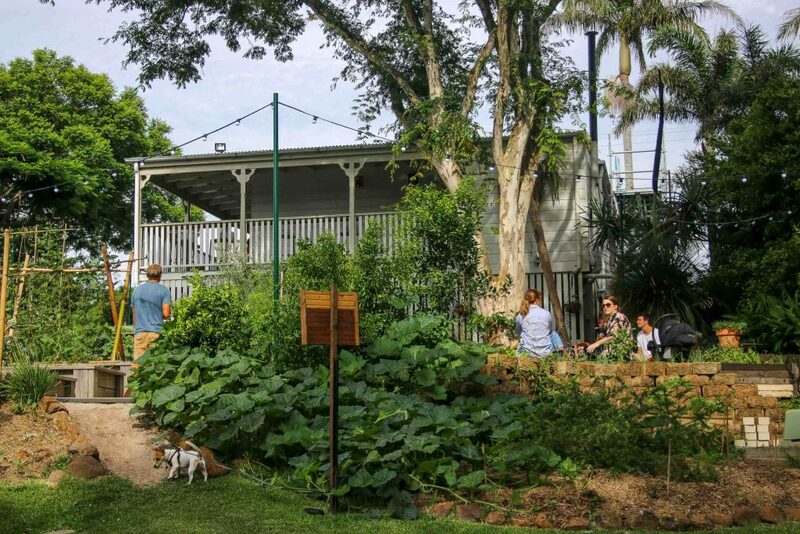 It’s lovely to take a flaky pastry and a coffee from the popular coffee cart outside the Deli and sit either inside the historic bakery or out in the organic Harvest kitchen garden overlooking all sorts of edible delights like artichokes, herbs, zucchinis and snake beans. There is a Flo Hive to the rear of the garden which looks quite majestic. 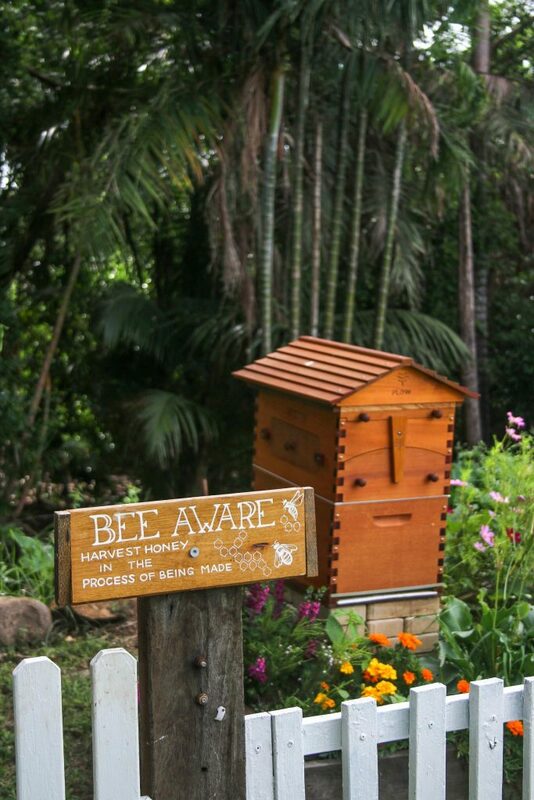 It’s lovely to think that the bees in the hive play such an important role as pollinators in the kitchen garden and that there is the bonus of Harvest honey. There are chooks as well, which forage freely in the undergrowth. Oh yeah, don’t forget to take a sourdough home for lunch! 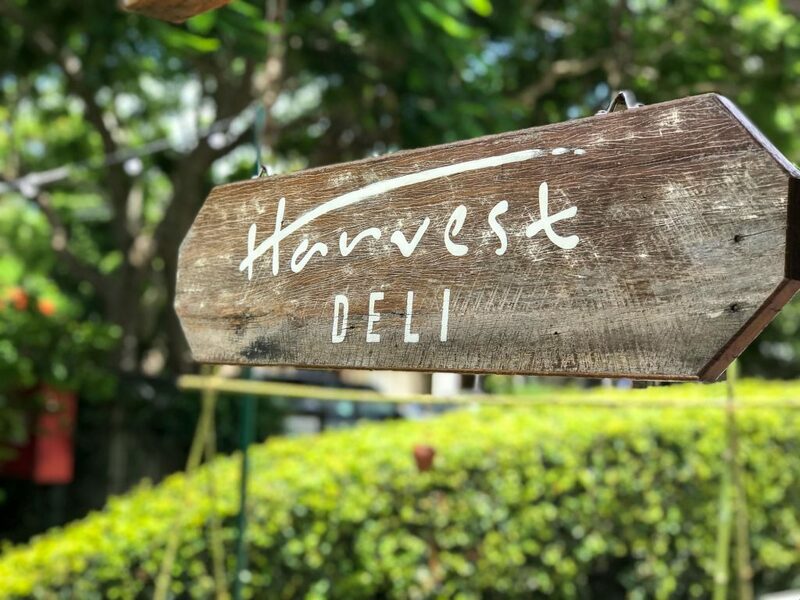 There are also delicious bites to enjoy from the Harvest Deli. 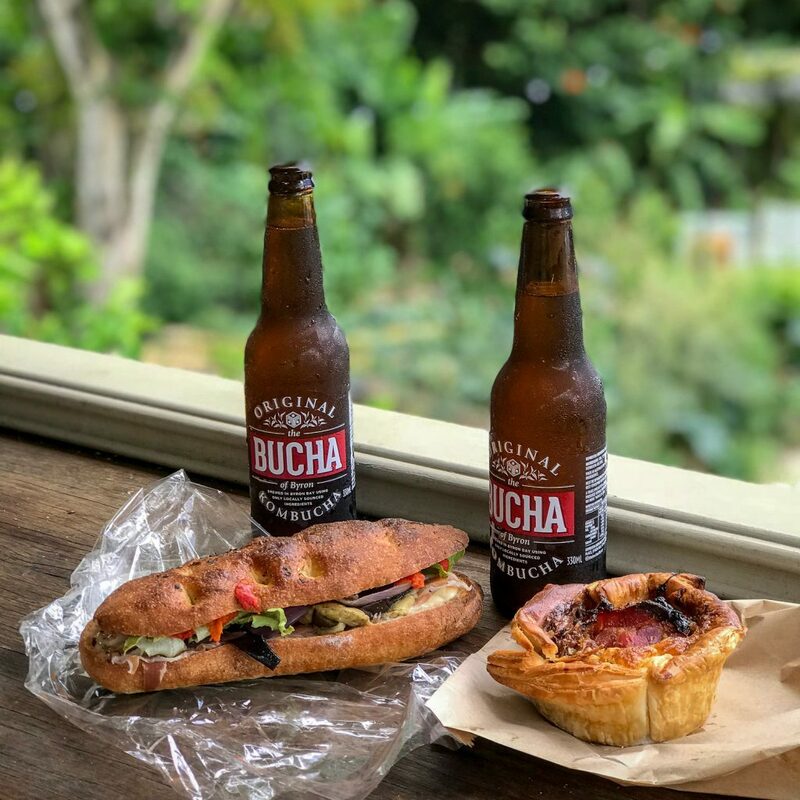 House made piadina, salads and hot pastries are available to take away or enjoy on the Deli verandah or you can make up a picnic to takeaway with cheese, charcuterie, bread and all the accompaniments. The deli also offers a delicious Picnic Hamper service featuring local and house made gourmet goodies. The Deli sells a great range of local ceramics and foodie gifts as well. 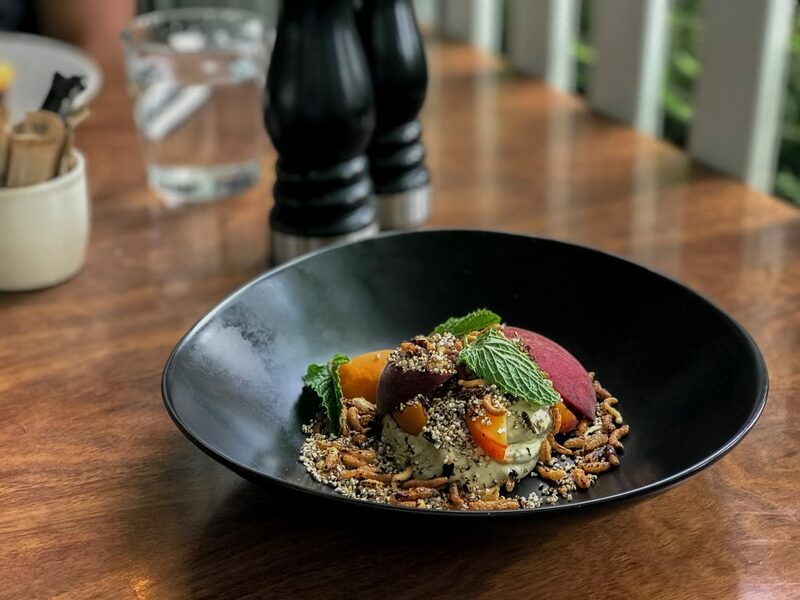 Another great Harvest experience, especially during Summer, is to sit out on the restaurant verandah for a sunset aperitif while you watch the colours of the sky change. In Winter, it’s nice to venture indoors to the leather lounges with your drink while you watch the symphony being played in the open kitchen. 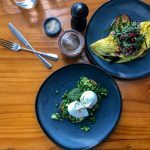 Harvest in Newrybar is definitely more than an award winning restaurant. 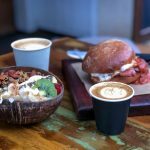 It’s a top destination for relaxed gourmet takeaway food, morning coffees and afternoon drinks. One tip about Harvest, make sure you book! I recently watched disappointed faces, who had travelled to the hinterland for breakfast, turned away from the restaurant because it was a full house. 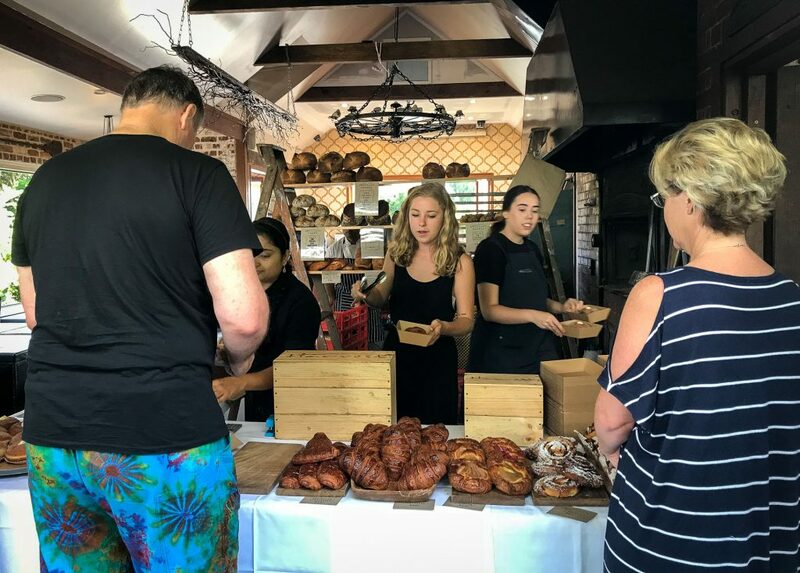 But then, there is always the Harvest Bakery (on weekends from 8am – 10am or until sold out) and Harvest Deli for casual eats to enjoy on the verandah or in the kitchen garden and that is actually my favourite reason to return to Harvest as often as I can.